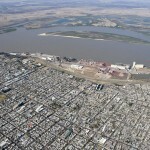 Rosario is the second largest city in Argentina, with a population of about 1.207.000 (including the greater Rosario area). 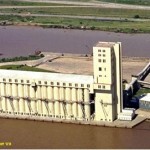 It is located in one of the largest and richest grain producing areas, and is also among the most industrialized regions in the country. There are factories building cars, spare parts, refrigeration equipment, railway equipment, home appliances, machinery for the dairy industry, etc. Also outstanding is the production of vegetable oil and by-products, dairy products, pressed meats, etc. 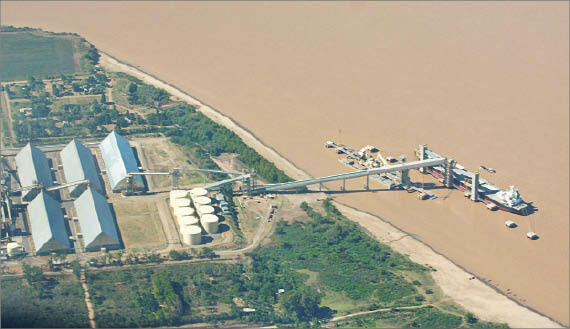 50% of the furniture industry in the country is spread in the outskirts of Rosario. The chemical and petrochemical industries are also very important and there are oil distilleries, as well as several plants producing bio-diesel from soybean oil. The road and railway network spreads from Rosario towards all points in the country, with the Nuevo Central Argentino, Ferroexpreso Pampeano, Buenos Aires/Pacific and Belgrano lines serving the city as well as numerous highways. Rosario is the head station of the grain railway line that connects it to Bah’a Blanca, actually not used as much as in years before. The airport is close to the city and has extensive domestic and international services. 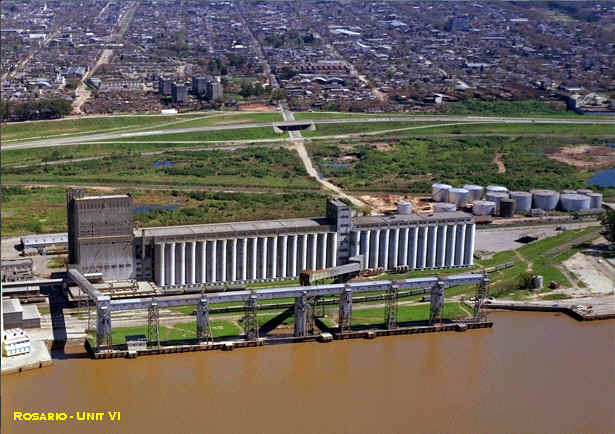 The importance of the city as a port has diminished in recent years due to the building of modern, more efficient grain terminals up river at Timbúes, San Lorenzo and San Martín, and down river at Villa Gobernador Gálvez, Punta Alvear and General Lagos, although the terminals to the South remain under Rosario customs jurisdiction. 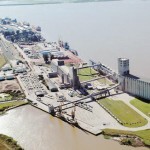 The trade in bagged cargoes died away, leaving the old city wharfs largely idle except for seasonal shipments of sugar and citrus, and most cargo operations, other than grain, have been carried out at Terminal 1. 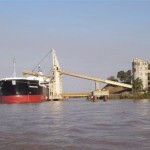 Port authorities, ENAPRO (Ente Administrador Puerto de Rosario), the public entity administering the port as from October 17, 2002, has handed out in concession the port operation for 30 years to Terminal Puerto Rosario S.A.
From North to South, these can be conveniently divided into 4 groups. 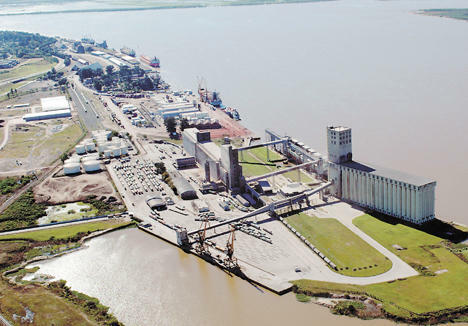 a) Puerto Rosario Terminal 2 .
c) Puerto Rosario Terminal 1.
d) Grain Elevators VI and VII berth. 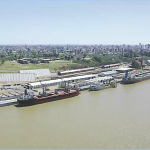 Only for vessels arriving to or sailing from Rosario. Between kms 410 and 412, left margin. Between kms 419,5 to 421,5 left margin. between kms 424 and 425, left margin. between kms 426 and 428, left margin. It´s to be noted that assignment of anchorage is as per instructions from local Coastguard Traffic Control Office (CONTRASE). 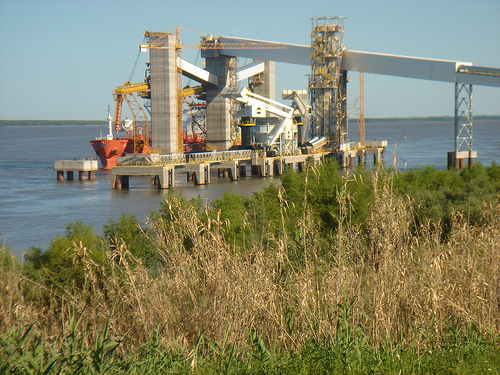 SE from southern dolphin, Punta Alvear berth, right margin. 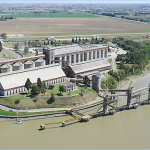 a) Km 408/410 for vessels arriving to or sailing from Punta Alvear, or arriving at Rosario from upriver ports. 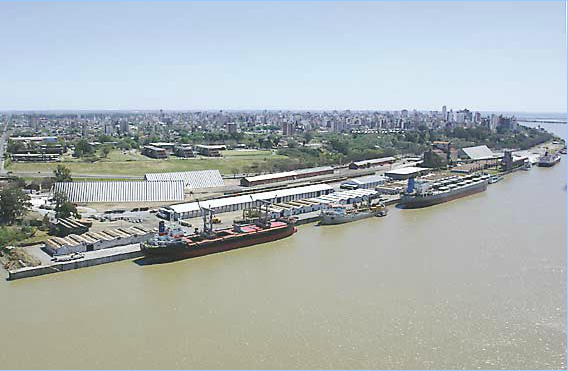 b) Km 421,5/424 for vessels sailing from Rosario for downriver zones. 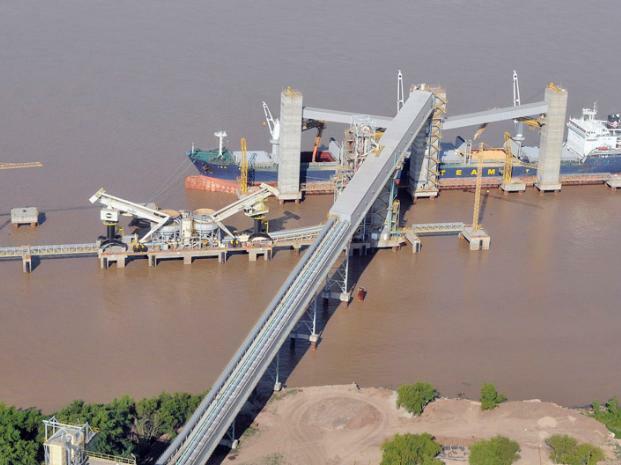 c) Km 399/401 for those vessels that, coming from upriver ports, are unable to swing at kms 408/410. d) Km 428/430 for vessels sailing from reserve anchorage. For datum depths at individual berths see Berth Descriptions. As per second phase of Hidrovía S.A. contract a minimum depth of 10,30 m (34 ft) with relation to an agreed reference level is to be maintained in the main channel. Maximum speed 6 knots within channel off berths. 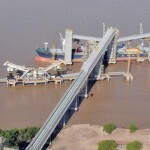 At private berths at managers discretion and prior agreement. Radio Rosario L5Q on 477 KHZ. Rosario Prefectura naval radio (coastguard) L6I VHF on ch 12. 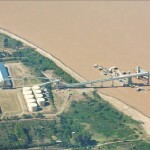 These may be chosen from a number of private companies, located at Rosario and Buenos Aires, that offer their services. 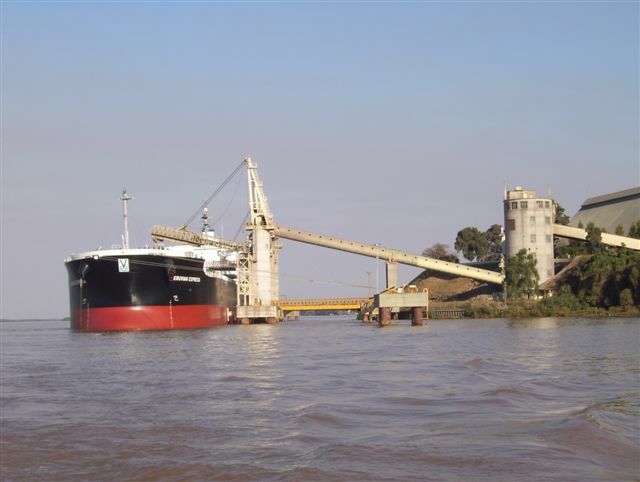 Port pilots are stationed at Rosario, river pilots at Rosario or Buenos Aires. Habitually no tugs used in this port. If required they must be ordered from Villa Constitución. Attention and treatment available. Several Private and Public Hospitals and Clinics. Emergency services. Ambulances available. Accommodation available all year round. 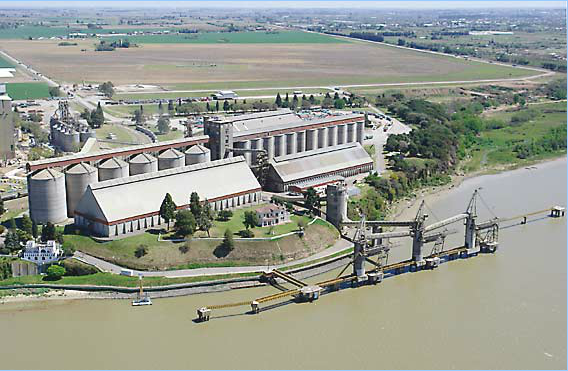 Highway Nº 9 connects Rosario with Buenos Aires southwards, Santa Fe northwards and Córdoba and Mendoza westwards. Efficient daily bus services in all directions. Railway traffic presently goods service only. 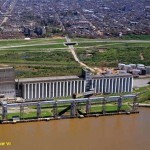 From domestic airport, regular daily flights to/from Buenos Aires and other cities. Must be arranged through suppliers and delivery by road tankers / barge at all city wharfs, Terminal 1 and Unit III elevators, if terminal or wharf operators approved. Careful coordination required to avoid dead freight extra charges for waiting time. 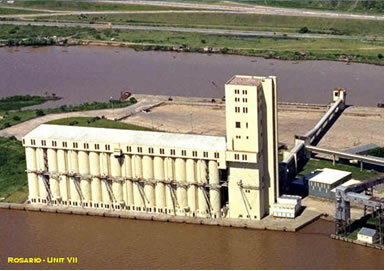 By barge, with terminal permission. Can be supplied at quay by local electricity company. Compulsory for all foreign flag vessels over 2000 GRT. Collection can be arranged as required. 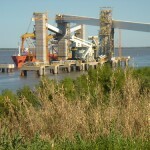 At Terminal 1 1×25 ton SWL dockside cranes, along with various mobile cranes. Limited repairs can be carried out by local workshops. 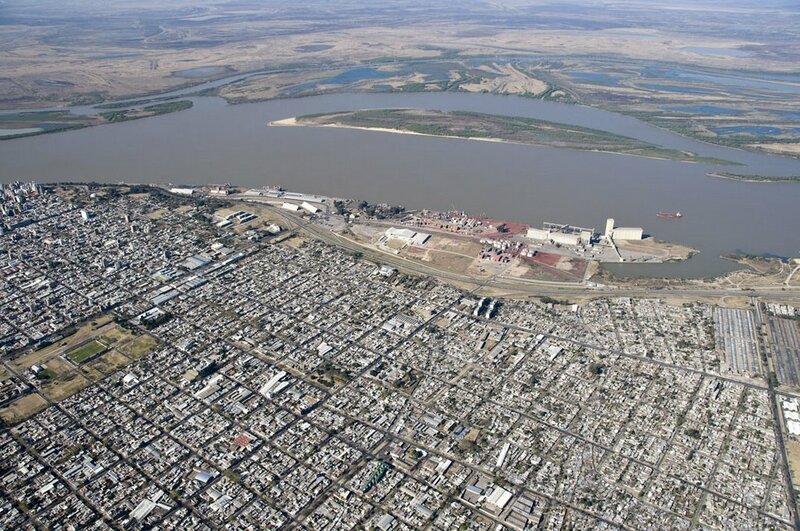 For larger jobs naval repair firms from Buenos Aires must be employed. Whilst available locally, if large quantities required it may be convenient to arrange them through ship chandler at Buenos Aires.